2013 is going to be an expensive year for Sally and I. I’ve lived on James now for just under three years and, although I’ve made essential improvements, the boat needs a great deal more doing to get it to the standard that we want. When I first moved on board at the beginning of April 2010, James was barely habitable. The rear cabin was virtually under water, the stove glass and flu was cracked which meant that the stove was unusable, and the original ply cabin top had perished to the point where rainwater would drip through the roof after anything more than a moderate shower. James, freshly painted, back on its mooring. Do the coach lines look straight to you? In November 2011 I had James taken eight miles by road transport to a local boat builder – a journey that cost me £1,100 – where they overplated the original cabin with steel. When James was brought back to Calcutt, I blacked the hull while the boat was out of the water then, when James was launched again, I spent three weeks painting everything else. After the new cabin was added and I had finished painting, James was fully watertight. The exterior looks pretty good now even if, to me, the coach lines look like the profile for Blackpool’s Big Dipper. The interior, aesthetically, is in much better shape too. I had some paint mixed to match the cabin’s interior Parana pine cladding so that I could paint over a few areas too badly water stained to sand out, the curtains were dry cleaned, the carpet steam cleaned and everything else cleaned with a large dollop of elbow grease. We did as much as we could without spending a fortune but we’ve now decided to bite the bullet and upgrade James as much as possible. We started in January by buying new curtain material. 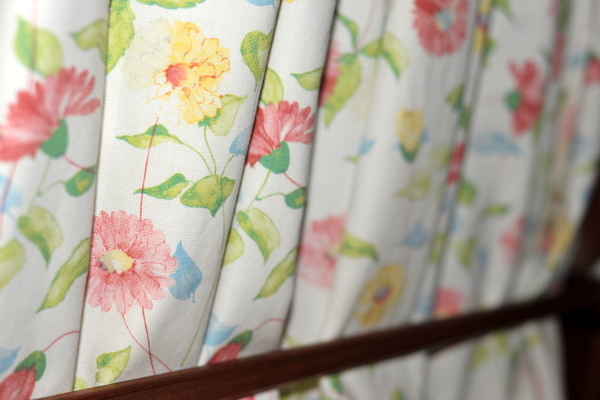 Sally made the curtains, and a fantastic job she’s done too. Material cost £286.70 for ten pairs for the regular sized windows, plus a single for the one bathroom porthole. In January we also bought a new mattress. I should have replaced it when I moved onto James. I don’t think the one that I inherited was terribly old but it had been in an uninhabited and therefore very damp boat for a number of years and had also been under one of the many spots where rainwater had leaked through the roof (resulting in some very suspicious looking stains on one side of the mattress). The original mattress was also quite soft. In fact so soft that it was causing Sally backache. We bought the new mattress from Argos. They delivered it almost to the boat. The roads were quite icy at the time so they would only come as far as the marina main car park. We had to transfer the mattress to one of the site vehicles the rest of the way. The mattress cost us £233.94 (reduced from £460) for a small double which is 6’3″ long by 4′ wide. Let me stray from the main subject for a minute and talk about beds and their sizes. I won’t take long and you may find the diversion very useful. Narrowboats by name, narrowboats by nature. With an exterior maximum width of just 6’10” and in my case in the back cabin where we have our bed, an internal width of 6’4″ there isn’t much room for a fixed bed with mattress plus a passageway by its side. As our bed is four feet wide, we have a passageway 2’4″ wide through the bedroom. The passageway is wide enough, but with a standard double bed 4’6″ wide, it wouldn’t be. Both Sally and I are quite slim. Sally is a size 8, whatever that is, and I am 5’10” tall and twelve and a half stone. Even so, a 4′ wide bed is quite a tight fit. If you are a little larger than us, and any taller than I am, you need to think carefully about the bed on your new boat. The width of the bed can be increased to include the passageway by fitting an infill section of mattress on a removable or folding base, but they you need to consider where you’re going to store the extra bits when they’re not in use. Back to the main topic: We wanted to make sure that the new mattress stayed in pristine condition. Our old mattress was often quite damp. It’s an often encountered problem on boats, especially where the mattress sits on the bed base. One solution is ensure that the bed base is ventilated. Ours was, but we still had a problem. We bought a Dry-Mat from Ship Shape Bedding. It works a treat. No more damp mattress, and no more £59 in my bank account. Our mattress wasn’t the only damp problem we had. The bedding in both dog baskets was constantly damp too. Warm dogs on bedding next to the cold boat floor = damp bedding. We had planned to fit some anti slip matting on the front deck so we put some under each dog basket to allow the air to circulate between boat and bed. It worked. We now have dry beds for both people and dogs. We’ve just ordered some more anti slip matting for the front deck to help protect the paintwork and manage the mess left by dogs with dirty paws. That’s another £87.60. Now that we’ve fully embraced spending money hand over fist, there’s no stopping us. I don’t know how long ago the current carpets were fitted in James, but their replacement is long overdue. Narrowboat flooring is subject to much abuse. In a house, the area of flooring that is used most is the hallway. 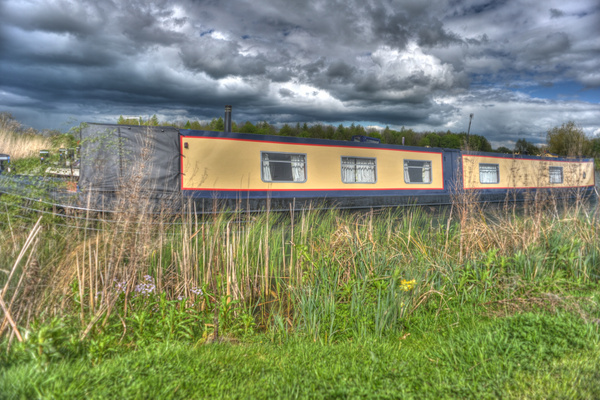 A narrowboat is just one long hall. I’ve steam cleaned the carpets on James now three times, but you can’t make a silk purse out of a pig’s ear. The carpets have had it. A carpet isn’t the most practical flooring to have in a boat when you have dogs. Our dogs, Charlie and Daisy, are generally very good. They don’t make a mess. The vast majority of the time, they’re clean and can be left for quite long periods between toilet breaks. Unfortunately, they’re dogs. They’ll eat just about anything that’s vaguely edible; sometimes with disastrous consequences. You only need one or two bouts of doggy illness before steam cleaning is neccessary and carpet cleaners aren’t the easiest of machines to manouver around a narrowboat. We’ve decided to fit Colonia English oak effect vinyl flooring. The cabin floor area on James is 24 square metres. The cost of the flooring, including fitting is £640. We would have liked solid oak flooring but it just wasn’t either practical or cost effective to have it fitted around the built in furniture on James. And then there’s the electrics. James doesn’t have an inverter. That’s about to change. We’re going to have one fitted on Thursday. I’m fed up paying for electricity when there’s sunshine that I can tap into. I’ve asked Tim Davis from Onboard Solar to fit a 300w system with an MTP controller. He’s coming to do that on 8th March. He’ll be leaving with £995 clutched in his hot, sweaty little hand. He claims that the system will pay for itself in about two years which sounds reasonable as I’ve paid over £500 for electricity for each of the last two years. And finally – for now – we’re going to fit an inverter. Today I was looking wistfully at the inverter on one of the shared ownership boats we look after. It’s a Vicktron 3kw pure sine wave charger inverter which can quite happily run power hungry appliances like vacuum cleaners, hair dryers and irons. Unfortunately at £2,300 it’s about £2,000 over my budget. We’ve decided to compromise. More about that later. Oh, I nearly forgot! Sally bought me a new chair for my office. The one I’ve been using for the last year was a bit of a liability. It was an old typists chair donated to me by the office at Calcutt. To put it mildly, it had seen better days. The base was five supports radiating from the centre column like spokes on a wheel. One of the spokes was broken so I had to carefully position the chair before I sat down to make sure that the missing “spoke” wasn’t behind me. Of course, I quite often forgot which resulted, much to Sally’s delight, in me being catapulted off the back of the chair onto whatever was behind me. The new chair cost £80. You may be wondering why I’m telling you about expenses I’ve incurred that may not be relevant to you and your boat. I’ll tell you why. James’ initial cost was quite low at just under £20,000 and with very good reason. When James was built in 1977, she was the bee’s knees and a beauty to behold. Sadly, the passage of time and the lack of some much needed TLC transformed her into an unatractive shadow of her former self. However, James was all that I could afford at the time – actually more than I could afford – but more than that, the boat just felt right. The ply cabin needed replacing, the rust on the gunnels crunched underfoot, the engine room was falling apart, there was no effective heating, the inside was extremely damp, the carpet was ruined and the electrics needed upgrading. You get what you pay for and James wasn’t worth much at the time. James was in a livable condition when I first moved on board, but only just. I was using James as a static floating home so the engine and the ability to live “off grid” weren’t important to me at the time. I needed a roof over my head. James just about provided one. I moved on board in April 2010. The spring and summer were a pleasure as long as anticipated the rainwater pouring through the roof during heavy showers and laid my collection of pots and pans in the right place. The winter was a different kettle of fish. Oh boy, was I cold! The winter of 2010/11 was severe. One night I recorded minus eighteen outside. The following morning I had a quarter of an inch of frost on the inside of the unheated engine room. My bedroom was next door. The morning temperature was just under freezing in the back cabin. When I leapt out of bed in the mornings it was to put on as many clothes as I could. I would often wear two fleeces, a fleece hat and gloves inside. It wasn’t warm and it wasn’t pleasant. I spent much of my time sitting as close to the stove as possible trying to keep warm. The following two winters were much different after I had the original ply cabin overplated and more insulation sandwiched between the old and the new cabin. I don’t really notice the temperature outside these days. I’ve just checked the temperature outside. It’s minus four, but I’m as snug as a bug in a rug inside the boat. Adding the new steel cabin and the additional insulation has transformed my life on board from endurance to comfort, but the transformation wasn’t cheap. Insulating and waterproofing James was just the first stage of James’ necessary upgrade. I intend to use the boat this year for what it was built to do, cruising. But I can’t do that until I’m happy with the engine and I’ve added inverter so that we can continue to use the more important of our 230v appliances while we travel. 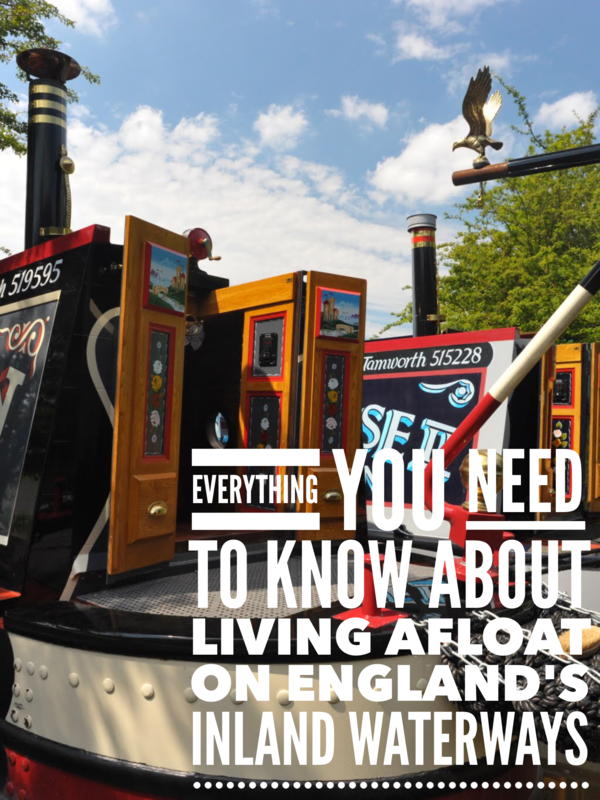 You can buy a narrowboat for relatively little money, but you need to make sure that it’s fit for purpose, especially if you’re going to live on board. You can survive on just about any condition boat. You won’t die, but you won’t have much quality of life either. You’ll see no end of decrepit barely afloat boats littering the canal side in many areas of the country. The boats, and the lifestyle of those on board, cost very little but, apart from the very few days in the UK when the days and nights are warm and calm, it’s not much fun. The first on your list of essential requirements is that your new boat is watertight and that it will be warm enough during the periods of the year that you will be using it. As far as I’m concerned a good solid fuel stove is essential but you have to consider whether it is enough. Painting your boat is hard work, requires a degree of skill to get a half decent finish or costs a fortune to have done professionally. As a very rough guide you can expect to pay £100 a foot so for my 62′ boat professionally applied paintwork would have cost over £6,000. Painting the hull requires very little skill but is very hard work and very dirty work. All of your steelwork needs to be constantly protected from the elements, as I know to my great expense. In total, the cost overplating the original wooden cabin on James was just over £10,000. The steelwork cost £6,5oo plus VAT, the road transport £1,100 and the remedial work another £1,000. Then I had to take three weeks off work to paint the new cabin. The cost of the work was hard enough to bear, but the disruption was incredible. I had to find somewhere else to live while the work was done. Fortunately for me, the ever considerate Roger Preen let me use one of the out-of-season hire boats for three weeks, so I was OK with the accommodation. But the mess that I had to clear up after the work was completed was incredible. All of the windows were removed from the original cabin prior to transportation then fitted into the new steel cabin after the boat was returned. All of the window openings were protected from the weather during transportation and while the work was done but in some areas they weren’t very effective. The boat was full of thick black dust produced as a result of grinding the sheet metal. In the dining area, red hot sparks had burned dozens of holes into an upholstered seat. The remedial work involved more grinding so that the windows, vents and chimney flue could be refitted, and the manufacture of hardwood inserts between the old and the new cabin sides around the windows. It all made quite a mess. If you’re considering having substantial remedial work done after you move on board, please bear this in mind. After all of this costly work, James still wasn’t ready for cruising. It’s not critical that I have 230v power when I’m off the mooring, but I want it. Maybe you feel the same way. I spend many hours each day editing this site, so I need my laptop. If I only had to think about my laptop, I would buy an adaptor that will run the laptop via the boat’s 12v supply, but we have other stuff too. We have a Kindle, and iPad, a mobile phone each, chargers for batteries, and a television. They’re the easy appliances to accommodate. They use very little power. However, there’s the heavy duty appliances to think about too; vacuum cleaner, iron and washing machine. I have a simple solution to deal with the iron… don’t use one. Sadly, Sally doesn’t agree. Before we met, I didn’t use an iron at all. I didn’t need to. I didn’t have many clothes but they were all chosen with care. Everything was very good quality but well suited to life on a boat. After washing and drying, I simply hung them up and watched the creases fall out of them. Sally had other ideas about my personal dress. It’s a woman thing. She wanted me in smarter, better coloured clothes. I have to agree that, when we go out these days, I’m far more presentable. The downside is that there are hours of ironing involved and I have to be careful getting on and off the boat so I don’t get my clothes dirty. After we’ve been out, I can’t wait to get back to the boat and into my good old crease free functional favourites. The vacuum cleaner is a problem. We have two dogs and a solid fuel stove. The combination means that there’s plenty of dust and dog hair to deal with. A dustpan and brush doesn’t do the same job. We need a vacuum cleaner if we intend to go on any cruises longer than a week. One option is a rechargeable vacuum cleaner that we can run through the inverter. Dyson make some good (expensive) ones. We’re looking into it. We also need a washing machine. At the moment we rely on the washing machines at the marina. They’re a bit hit and miss to be honest. Their cleaning capabilities are adequate but no more than that. There’s also the inconvenience of carrying loads of washing to the shower block, hoping that the machines are free, and making sure that we have enough machine tokens to run them for the required time. We would both rather have a washing machine on board. We’ve identified a space where the compact washing machine will fit. There’s a 230v power point already in place. We just need to run a cold water supply to it from the bathroom six feet away. The low power mains appliances are no problem. I’m going to have a fairly small pure sine inverter (1600w) fitted which will allow me to run them from the domestic battery bank, but I’ll have to think carefully about the larger items. Not only do I need a bigger inverter if I want to run these appliances from the leisure batteries, but I also need the inverter to be pure rather than modified sine to run the Zanussi washing machine that we want to use. As I pointed out earlier, at £2,300 a pop, I can either have a powerful pure sine inverter, or another car. We’ll decide how to deal with this issue when we’re able to spend more time cruising than we do now. James was a cheap boat to buy but it needed, and still needs, a great deal spending on it before it’s in the condition and has the level of equipment that suits us and the lifestyle that we hope to achieve in the near future. When you buy your boat, consider what you want out of it. Work out how far the boat that you’re looking at is in terms of condition and equipment and how much it’s going to cost you to get it to where you want. You may find that going cheap is the most expensive option. Some people take to boating earlier than others. Amy and James have been living on their narrowboat since their early twenties. They love the lifestyle. In fact, they’re about to sell their current boat so that they can buy and restore their own historic narrowboat. If you’re interested in a ready made liveaboard narrowboat, you can find all the boat’s details at the end of their case study. You can read about their life afloat and their boat here. Now that the forum login problems have been resolved, forum posts and visits have seen a dramatic increase. There’s a wealth of information on the site in general, but if you’re struggling to find the answer to a particular issue, the forum is the place to find it. I’ve listed some of the more popular posts below but if you can’t find what you’re looking for, ask your question on the forum. If you don’t know how to create a post, or if you can’t log in, please let me know. I’ll be more than happy to get you up and running.